North Korea: "All Our Atomic Bombs And ICBMs Are Aimed At U.S., Not At Southern Brethren, China Or Russia"
While there were some tentative signs of a diplomatic detente and mending of relations between North and South Korea after today's summit between the two nations, the first in more than two years, it appears any attempts to ameliorate tensions hit a sudden hurdle when the United States is brought into the equation. Case in point, as Reuters reports, North Korea said that it would not discuss its nuclear weapons with Seoul because they were aimed only at the United States, not its “brethren” in South Korea. Officials from the two nations sides said they agreed to meet again to resolve problems and avert accidental conflict, amid high tension over North Korea’s programme to develop nuclear missiles capable of hitting the United States, but Pyongyang said disarmament would not be part of the discussions. "All our weapons including atomic bombs, hydrogen bombs and ballistic missiles are only aimed at the United States, not our brethren, nor China and Russia," Pyongyang’s chief negotiator, Ri Son Gwon, said. Meanwhile, North Korea was clear that its beef is not with South Korea, but with just one person: Donald Trump. Today's meeting between the Korean neighbors comes just hours after the WSJ strategically leaked that the Trump administration, and especially the generals in it, were advocating a "bloody nose" approach to a military conflict with North Korea, effectively a surgical strike which would most likely take out Kim himself. Desperate to stay relevant, and part of the process, a spokesperson for the White House’s national Security Council said North Korean participation in the Olympics would be “an opportunity for the regime to see the value of ending its international isolation by denuclearising.” Not surprisingly, the US initially responded coolly to the idea of inter-Korean meetings, but Trump later called them “a good thing” and said he would be willing to speak to Kim. “At the appropriate time, we’ll get involved,” Trump said on Saturday, although U.S.-North Korean talks appear unlikely, given entrenched positions on both sides. Also, in keeping with the party line, the US insists that any future talks must have the aim of denuclearization, and the North-South thaw has not altered the U.S. intelligence assessment of North Korea’s weapons programs. The consensus, according to five U.S. officials familiar with the classified analysis, is that Kim remains convinced the United States is determined to overthrow him and that only a nuclear arsenal that threatens America can deter that. One of the officials said the North-South talks were likely to follow the pattern of past diplomatic efforts, in which the North has benefited from additional food and other aid without making any concessions on the weapons front. The additional danger now, said a second official, was that Kim would seek to use the talks to take advantage of Trump’s sometimes bellicose rhetoric to try to drive a wedge between Washington and Seoul. For now, South Korea is much more receptive to the North's overtures. Still, in spite of the North Korean negotiator’s remarks, South Korea’s Unification Ministry said it believed Tuesday’s talks could lead to discussion of a “fundamental resolution” of the nuclear issue. “We will closely coordinate with the United States, China, Japan and other neighbours in this process,” it said, adding that Seoul had asked North Korea to halt acts that stoke tension. Tuesday’s meeting followed a year of ramped-up North Korean missile launches and its sixth and most powerful nuclear test, which have prompted a stepped-up U.S.-led campaign to toughen U.N. sanctions, which Pyongyang has called an act of war. As we reported this morning, in an act of concession, Seoul said it was prepared to lift some unilateral sanctions temporarily so North Koreans could visit for the Winter Olympics. North Korea said its delegation would include athletes, high-ranking officials, a cheering squad, art performers, reporters and spectators. 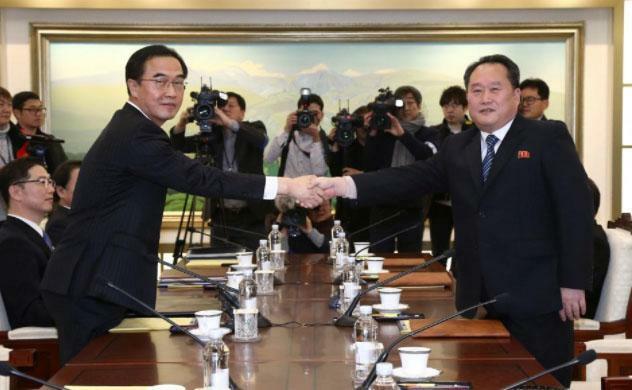 Talks to work out details would be held soon, the South’s unification ministry said. “We came to this meeting with the thought of giving our brethren, who have high hopes for this dialogue, invaluable results as the first present of the year,” Ri said at the start of the meeting. The talks were the first between the two Koreas since 2015 and were held at the Peace House on the South Korean side of Panmunjom truce village. North Korea cut communications in February 2016, following South Korea’s decision to shut down a jointly run industrial park.